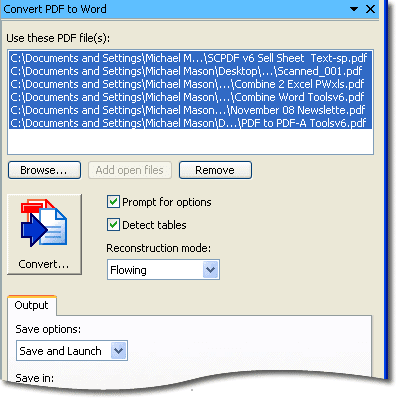 Solid PDF Tools v6 and Solid Converter PDF v6 include batch conversion and creation palettes that allow you to easily convert multiple PDF documents at the same time, or create a new PDF by combining multiple PDF documents. 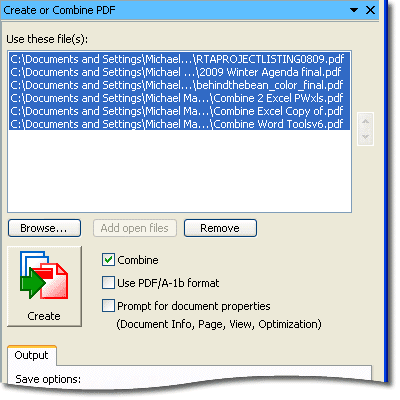 In addition, Solid PDF Tools v6 allows you to work with multiple PDF files, converting them to PDF/A (for long term archival) and validating their compliance with the ISO 19005-1 specification. Working with palettes is as simple as browsing your computer to locate the files you'd like to work with and clicking the "Create" or "Convert" button. It really is that easy! You can automate your conversion and creation tasks via scripting. Please visit our developer blog for more details.